I didn’t always care for hummus. Not being terribly fond of garbanzo beans, that’s not surprising I suppose. Every so often, though, I like to go back to foods I don’t care for and see if my taste buds have changed. They never did with regard to hummus …. until I tasted some good stuff. YUM. And then. And then…. I finally composed a recipe that took the best of several I had used before and now it’s SO easy and tasty. Here is the hummus recipe and the wrap recipe that I use to encase this Tasty Tuesday delight. Turn on food processor and drop the garlic down the feed tube, processing until it is minced. Add the rest of the ingredients and process until the hummus is coarsely pureed. Serve chilled or at room temperature. Melt 1 T. butter in skillet over medium-low heat. Add ½ of a red onion and cook slowly for 10-15 minutes, stirring occasionally, until soft and translucent. Set aside. Grill a spinach tortilla on a grill pan over medium heat for 1 minute. If you don’t have a grill pan just set the tortilla on the open flame for about ten seconds each side ~ just until soft and pliable. If you are one of those strange people who have an electric stove you can use a skillet instead. Allow the tortilla to cool slightly and then spread about 1/3 cup hummus down the middle. Add a few of the cooked onions, 2-3 artichoke hearts, 6 kalamata olives, and a few of the salad greens. If you like, add a bit of crumbled feta. Carefully wrap the tortilla, then slice down the middle, and share with your favourite person. 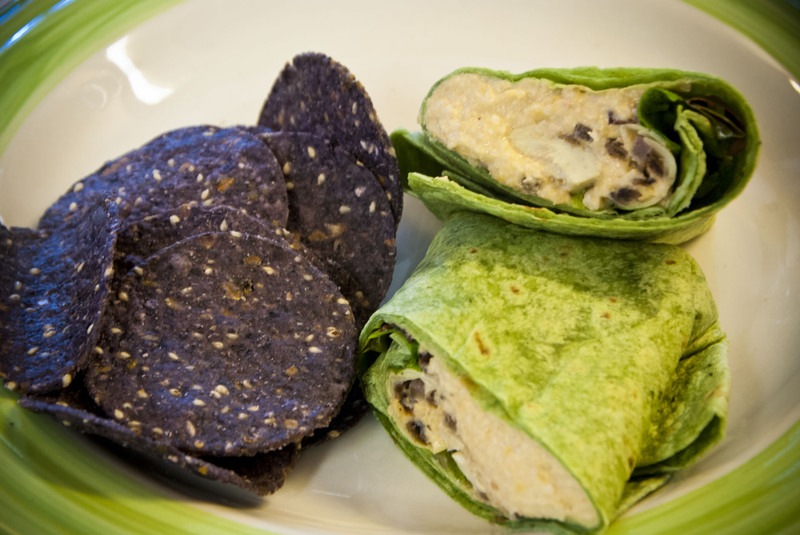 This wrap goes nicely with Sesame Blues corn tortilla chips and a tall glass of your favourite iced tea.